In the coming months the Signing Professionals Workgroup will create the exam and begin to approve vendors authorized to offer the Certified Signing Specialist designation program. 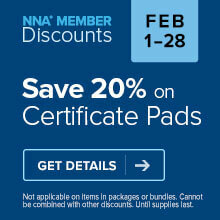 Once that occurs, you will be able to obtain your certification from vendors such as the NNA. In the interim, the NNA has updated its current certification program to comply with the Certified Signing Specialist Standards, and you will continue to be an NNA Certified Notary Signing Agent. If you purchased a background screening-Notary Signing Agent certification package from the NNA in 2013, wait until we contact you. Your screening meets the Standards. The NNA will contact you one year after your last screening to authorize another at no extra cost. If you purchased a screening from the NNA in 2012, we will contact you to let know that you need to be re-screened. That screening will be offered at a one-time discounted fee of $39. If you purchased a screening from the NNA in 2011, you will need to be re-screened. That screening is offered at a new $65 rate. If you purchased a background screening from another vendor in 2013, send us a copy of your receipt. You will be given a store credit for the amount you paid for that screening when you purchase a new screening from the NNA at $65. Going forward, the normal cost of the more rigorous annual background screening compliant with the Signing Specialist Standards as well as the Certified Signing Specialist annual exam from the NNA is $65. Updated 8-21-14: There are eleven (11) states where convictions can only be reported for seven (7) years. The states are: CA, CO, KS, MD, MA, MT, NV, NH, NM, NY, and WA. New York has restricted the criminal checks available for past or current resident to a statewide level and does not offer county criminal court searches. New York is the only state with this restriction. DMV record searches are unavailable in the states of WA and PA.
As mentioned above, the SPW is developing procedures for approving vendors to offer certification services, such as background screening and certification exams. The SPW believes that a strong vendor management program is crucial to the success of the Standards because vendors will be the ones verifying that you are properly qualified. To be approved to offer certification services, vendors will have to demonstrate that their programs fully comply with the Standards. The SPW also will create a system to monitor and audit vendors to make sure that their certification services remain in compliance with the Standards. I just need to take the test and cant get into it,can you help me? Hello, We're sorry you're having technical difficulties with an exam. Please contact Customer Service at 800-876-6827 or CustomerService@nationalnotary.org and let them know you are having problems accessing a test. They should be able to assist you in resolving the issue. I have my NNA certificate as Notary Signing Agent. How do I get the designation as a "Certified Signing Specialist"? This is a step up, correct? Hi Barbara, The SPW is working on the exam, so the Certified Signing Specialist designation is not yet available. When we have updates, we’ll make sure our social communities are informed. 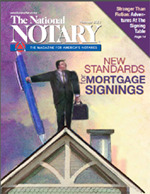 In the meantime, if you’d like to read more about the designation, please visit NationalNotary.org/Standards or SigningProfessionalsWorkgroup.org. When will the new certification and training be posted for the new mortgage documents. Hello. Just to clarify, are you referring to the SPW's Certified Signing Specialist training or training related to the new Closing Disclosure document changes scheduled to roll out later this year? What is the motor vehicle record standard? In doing my annual profile update, I searched for newer information about the SPW and CSS, but was not successful. I wonder if you might let us know where this certification stands now? Hello and thanks for reaching out. The SPW hasn’t announced when the exam will roll out, so the certification isn’t currently available. We will share the latest news with our readers as soon as more information is available.